Gutierrez also retweeted a news release Thursday detailing Mexico’s request to the UNHCR. The plan was agreed on by members of Mexico President Enrique Pena Nieto’s government, however President-elect Andres Manuel Lopez Obrador’s incoming administration has vowed not to criticize the plan, the official said. After they take office, they have agreed to work together with the U.S. to attempt to make the plan endure long-term. Just as he has been effectively dealing with the rest of the problems which his predecessor left him, so has President Trump dealt with the problem of migrants from Central and South America attempting to “storm the gates” of our Sovereign Nation. I question the timing of this current “migration”. Gentle readers, do remember when all of these “migrants” began arriving from Central America? It was the spring and summer of 2014 under the benevolent reign of King Barack The first, when 50,000-100,000 unaccompanied minors made the long arduous journey from Central America across Mexico to our Southern border, where they were graciously welcomed to our Sovereign Nation by President Obama. Even though a significant number of these “unaccompanied minors” were found to be carrying measles and other childhood diseases which our country had all but eradicated, they were spirited away on military transport planes to bases around the country and were later dispersed among our general population. With an all important Midterm Election happening on November 6th, this present “migration” has a very bad smell to it…and I’m not talking about the migrants themselves. Just as there has been copious amounts of money spent by George Soros and other financial backers of the Far Left Democratic Party to disrupt the candidacy and presidency of Donald J. Trump, as the video above shows, I believe that there is a political element to this “migration” which sprang up out of nowhere as an “October Surprise”. The Godfather of Conservative Talk Radio, Rush Limbaugh, agrees with me. …somebody’s paying for this. Somebody. They have to eat. They have to be drinking things. They’ve gotta be using facilities. Somebody has to be buying the gasoline to transport vehicles, to power the vehicles that are being used here. I guarantee you these people are not walking every step of this thousands-of-miles journey. 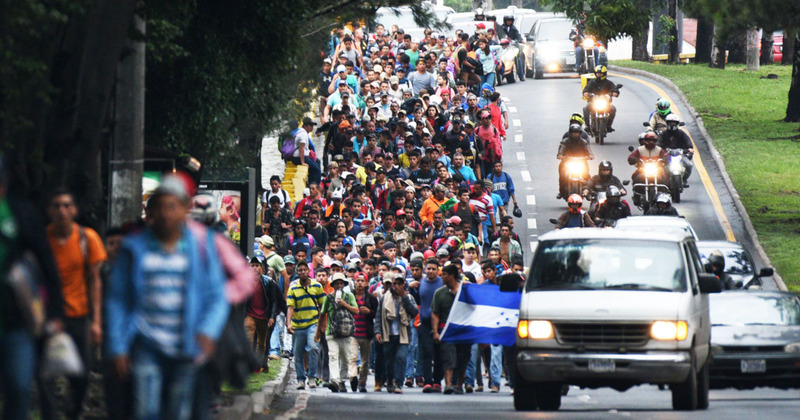 So who thinks that this caravan arriving within a week, say, of the midterm election date helps Democrats, by itself? How does this help? This is what got Donald Trump elected. This is what turned on the giant Trump coalition: The invasion at the southern border that neither political party took one step to stop. So what’s the calculation here? Well, we had a caller earlier suggesting that the calculation may well be that there has to be something go wrong. You put 4,000 people on a trek; there’s gotta be somebody get sick. There has to be some fights that break out somewhere. Somebody in this gang of people gotta have a gun. All it’s gonna take is one little incident of violence, maybe an allegation of sexual abuse, and maybe started by Trump law enforcement personnel. I wouldn’t put it past them if that’s the game plan. But I’m struggling to see, other than just the general chaos it’s creating and maybe the Democrats think that people to want stop this chaos and that this chaos is only because of Trump, that if Trump weren’t there, none of this would be happening, and so let’s get rid of the Republicans. Just as they did during the Obama Administration and the 2018 Presidential Campaign, the Democrats are greatly underestimating the American People and greatly overestimating their own intelligence. This is the exact sort of political garbage which led to the election of an American Businessman and Entrepreneur as the 45th President of the United States of America. If this, indeed, was the Democrats’ big “October Surprise”, so far, it has had all of the impact of a wet firecracker. Sure, the Main Stream Media will play it up, but average Americans quit listening to them years ago. The only thing that this new “Migrant Caravan” has accomplished is to get a Senior Administration Official to reveal that our nation and Mexico will work together to stop these and future “migrants” before they even reach our Southern Border.